One day in the middle of a walk, Candice said, “I want to have a baby.” I thought, in this particular instance, that she meant a hypothetical baby set somewhere in the future. So I agreed that it was a good idea. Then she clarified that she wanted a baby now. At that point, I suspected she was just having an emotional flare-up. There was simply no logic in what she was saying. She knew the status of our bills; she knew we couldn’t afford to have a baby. Besides, we had only been married a little more than a year and still had a lot of exploring to do as new residents of Colorado. I realized I had to play the role of crisis manager. I had to talk her back from the ledge and encourage her to abandon the dangerous leap she was contemplating. Reasoning from logic, I talked about our finances not adding up. I reminded her of the dramatic adjustments a baby would require to our social lives, our living arrangements, and our concept of free time. I waited for her response. She seemed to be considering my counteroffer. As she nodded her head in consent, I knew I had done it—I got her to hit snooze on her biological clock. That is, until we went on another walk—this time with an older couple that had mentored us when we were dating. Hubert and Mary Morken are action people. They like their walks brisk and over rough terrain if it’s available. My breath ran short several times as we climbed hills and dodged rocks with this couple the age of our parents. A sign along the path we hiked read, “Beware of rattlesnakes,” but I was more afraid of the conversation taking place between the women in front of me. Mary and Candice were talking as intensely as we were hiking. I couldn’t hear everything they were saying, just an occasional word—fertility, baby and money—among them. I knew the issue of having kids was, once again, front and center. It's hard to summarize the past four weeks of packing, driving, visiting, driving, apple picking, flying, speaking, birthday celebrating, packing, flying, packing, cleaning, flying, sleeping, packing, and finally, settling. But there you have it: the summary of our journey from our home of 13 years in Colorado to our new home in Louisville, KY. The Gateway Arch on our drive east from Colorado. Alongside the tree outside our apartment window in Kentucky. Here's a bit of the view out my window heading north from Kentucky to Ohio. And the view behind my seat. Ohio provided lots of cousin time. We raked the leaves and jumped in them. And this one nearly touched the sky. Or at least the tops of the trees. Mid-way through our trip, Steve and I headed even further north to Minnesota for a long-planned speaking engagement at Northwestern College. While there, we toured a well-known ministry. And spent two days ministering alongside MJ and Julie, founders of Future Marriage University, as well as Brittany, the chapel coordinator for NWC. We found some quiet family time at a little lake in Michigan. And even found a way to get a group shot (thanks to an old lawn chair and my camera's timer). In Ohio, the girls went to a fund raising tea for my sister's adoption from Ethiopia. Then Steve and I headed back to Colorado to finish packing and, thanks to some amazing friends, spent our last few hours in our old hometown at our favorite place: The Braodmoor. Whether you're single and waiting for a spouse, married and waiting for a baby, or, like us, waiting for things related to a change of job or move, waiting is wearying. Whatever it is you're waiting for. Unless what you're waiting on is the Lord. And that's the lesson I'm learning as we've been moving from there to here. The messiness of a launch—whether it's a new business or the birth of a baby—should be expected precisely because inertia is being upset. On the heels of a quirky summer and turning 40, we're heading out on a new venture. But first we're going back to visit where it all began. Once upon a time, I wrote an article about family hikes. In it I said, "We figured if we raised two kids in Colorado and never got out in nature, they'd never let us live it down. 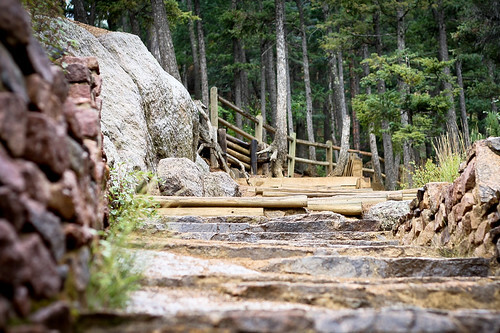 So we bought some hiking boots and a guide to the Pikes Peak region and started walking." That was five years ago. Since then, we've had two more kids and out of necessity, slowed down our pace. Recently we dusted off our trail book, laced up our hiking boots, and headed back to nature. Five years ago I wrote, "Encouraging a four year old to keep going to the end of a 2-mile hike can be a chore. But when he knows there's a root beer float waiting for him at the end of the trail he's more likely to embrace the challenge. And when his little legs get tired and he starts begging for someone to carry him, we often divert his attention by singing songs or practicing his letters ('What does apple start with? ', 'How about baseball? ', etc.)" But even being less-than-prepared, we made lots of memories in a beautiful place. Back then I wrote about the joys of guilt-free chocolate on the trail. "Who wouldn't love a reason to eat some favorite high-energy snacks, knowing the exercise involved will burn those calories?!" For this hike I forgot to buy snacks before we left. And so, we stopped here. Very salty snacks. We should have brought more water than we did. Instead, we shared our one water bottle and focused on some more of that advice: The thrill of discovery. There's something new and innocent about a child discovering God's creation for the first time. A new bird, a bubbling stream -- or in this case, our state flower. All these and more provide lots of oohs and ahhs on the trail while instilling a respect for nature. Realizing "they can do it" is a big deal for little ones. Each step taken over rough terrain, each trail completed, even the occasional scraped knee can build self-esteem in kids. And even if they don't self-actualize, they'll be glad for some undistracted time with their favorite toys: Mom and Dad.